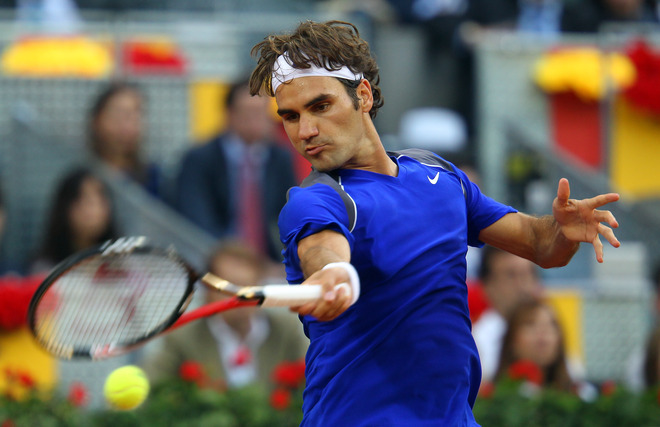 Finishing moments ago, Roger defeated Xavier Malisse to make the quarterfinals of the Madrid Masters. Federer had 5 aces in the straight forward 6-4 6-3 win which took just over an hour on court. Next up for the Maestro? Tsonga or Soderling, who play later today. Novak Djokovic (@DjokerNole on Twitter) advanced to the quarterfinals as well with a easy 6-1 6-2 win over Guillermo Garcia-Lopez. The match up most fans were interested in today won’t happen because Del Potro withdrew with a hip injury so Rafa Nadal gets a walkover into the quarterfinals. Del Potro’s hip injury puts him at risk for playing Roland Garros and rules him out of next week’s Rome Masters. Read the full story here. Check out the latest photos at FedererFan ZeroSeven on Facebook. You will see more updates, news links, photos and video from the new personal Facebook page as a result of many fans finding it better for them to keep up and interact with the site.